Experience the mission as Shatter. Imagine seeing through her eyes with the Mission Vision Shatter figure. Look and click between 3 unique views: Jet Vision, Tracker Vision, and Decepticon Vision. Choose a view and imagine adapting to any mission like Shatter. The evil Decepticon bounty hunter modifies her optics to chase, track, and capture Autobot targets. 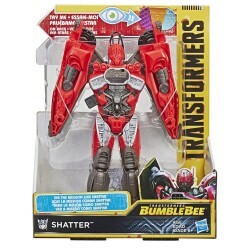 This 8-inch Shatter figure converts easily from robot to jet mode in 6 steps. 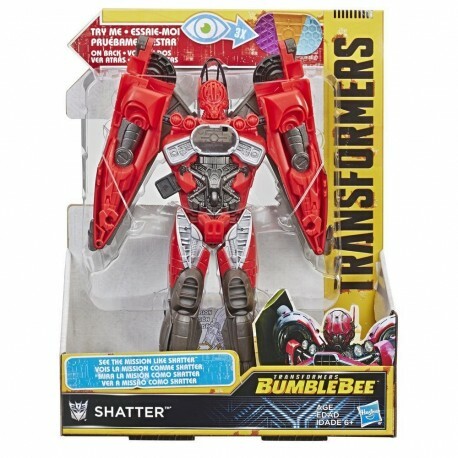 Kids can also collect the Transformers: Bumblebee Mission Vision Bumblebee figure to see the mission as the Autobot scout. (Sold separately. Subject to availability). • Includes Shatter figure and instructions. • SEE THE MISSION AS SHATTER: See the mission through the optics of Shatter. Look and click between three unique views: Jet Vision, Tracker Vision, and Decepticon Vision. Imagine choosing the best view for action-packed missions! • CONVERTING ACTION: Convert 8-inch Mission Vision Shatter figure in 6 easy steps from robot to jet mode -- simple conversion fun for kids ages 6 and up. Mission Vision works in both modes!